Allison takes a look in Ethan’s ear. 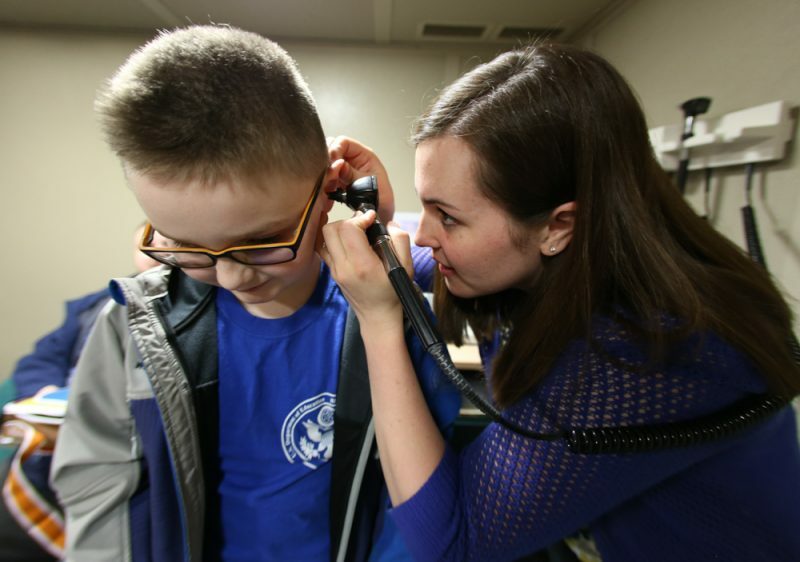 Hearing loss is one of the most common issues found at birth and, luckily, one of the most treatable according to Akron Children’s clinical audiologist Allison Harris. 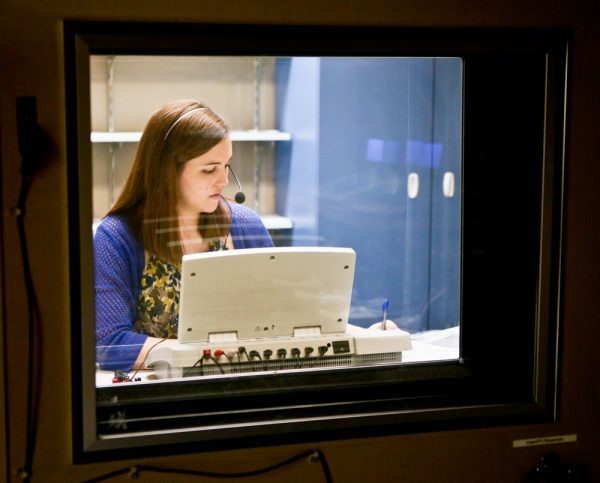 As 1 of 5 audiologists in the hospital’s rehabilitation department, Allison sees inpatients and outpatients for hearing and central auditory processing tests, sedated hearing tests in the OR, and hearing aid fittings and evaluations. On this particular day, 9-year-old Ethan and his dad, Joe, are seeing Allison for a hearing aid check. Ethan was diagnosed with a mild hearing loss at birth and has worn hearing aids since he was 6 months old. Showing Ethan’s discreet hearing aid that sits behind the ear. Having worn an older, bulkier model with bright blue ear molds for years, Ethan recently took a break from wearing his aids until he got a more discreet looking pair that sit directing behind the ear. Allison escorts Ethan and Joe to one of the department’s soundproof booths to check how well he’s hearing different frequencies with his new aids. She asks him a series of questions including how much he’s been wearing them and whether he thinks he is hearing better at school. Joe has been pleasantly surprised with how the new aids have impacted their home life as well. In the booth doing Ethan’s hearing aid testing. Allison leaves the booth and watches through a window as she administers the hearing check. Ethan misses only a few words and Allison moves on to checking how well he’s hearing frequencies. “We test pitches that are important for understanding speech,” she said. Joe sits quietly in the room with his eyes closed. “I close my eyes and make a conscious effort to not react to the noises so I don’t inadvertently assist him,” Joe said. Allison adds background noise to the booth to make it a little harder for Ethan to hear her. She runs through the tests for the second time to double check and make sure he wasn’t guessing on any of the sounds. After finishing in the booth, Allison takes Ethan and Joe to the hearing aid room to get Ethan some new domes (the small, plastic bell-shaped piece at the end of the tube that’s inserted in the ear). With no use for Ethan’s old hearing aids, Joe donates them back to the hospital to be used as loaners for kids whose own aids are being repaired. On average, a pair of hearing aids cost $5,000 and is not covered by most insurance plans. The hospital is a provider with the Ohio Hearing Aid Assistance Program, which assists low-income families whose children have permanent hearing impairments to purchase hearing aids. 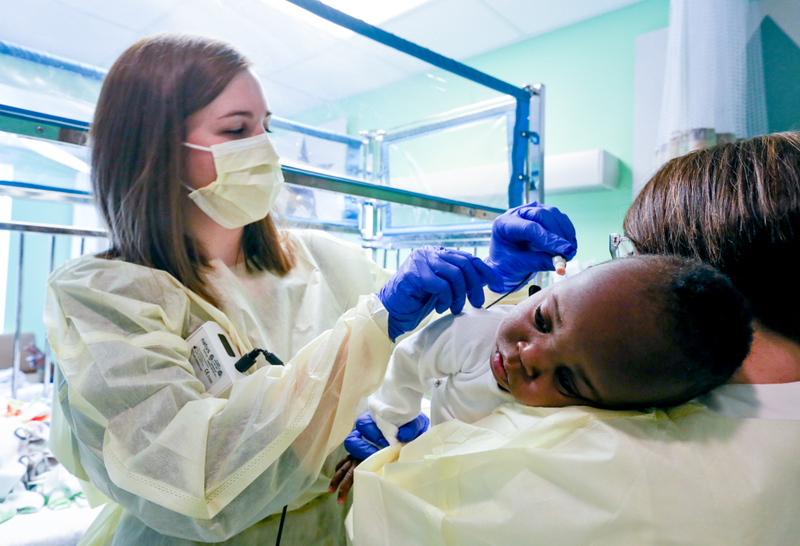 Allison’s next patient is 2-year-old Leon, who was admitted for failure to thrive, dehydration and croup. Born prematurely, Leon was referred for an infant therapy evaluation and Allison is doing his bedside hearing check. The 5-minute test consists of a tympanogram to check for fluid in the middle ear and to see how the eardrum moves, and an otoacoustic emissions test to check the function of the hair cells in the inner ear when 2 tones are played. Allison explains to Leon’s parents that he passed in one ear but not the other. 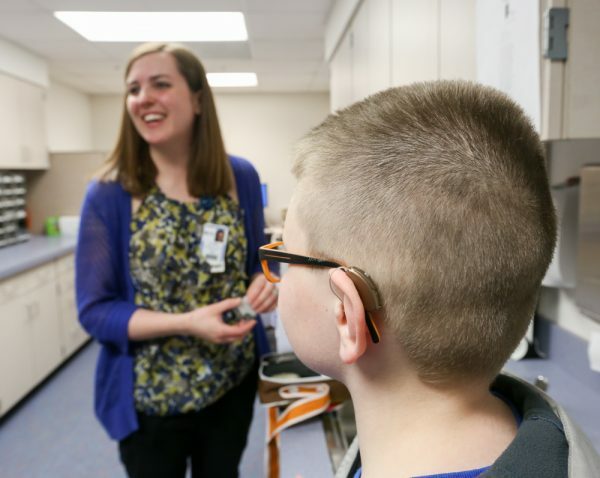 For kids who aren’t capable of sitting still in the booth and participating – often very young children or those with autism – Akron Children’s is one of a few places that offers sedated hearing tests. Allison admits it can be challenging to deliver the news of a hearing loss to a family who had no idea anything was wrong. Her favorite part of the job is doing hearing aid fittings on kids who have never worn them before. “It’s moving to see their faces light up when they can finally hear,” she said. Allison considers herself lucky to have landed the position right out of grad school in 2013. If you’d like to learn more about how you can make a difference for children and families, visit our job board or follow @ChildrensJobs on Twitter.